Preconceived notions are not good. They just aren't. You see, these notions lead to you forming an idea about something, and when it's ingrained it becomes quite hard to shake that off. SUVs, for instance, are always regarded as big, portly automobiles that aren't quick or thrilling to drive. And then there's the oil tanker rivalling body roll that's sure to make passengers feel queasy. But, there is one SUV out in the market that just blows every notion you've had about an SUV, to smithereens. Ladies and gentlemen, the Lamborghini Urus is here and it is unlike anything we've driven before. For starters, just look at it. Is an SUV even supposed to look the way the Urus does? The design is classic Lamborghini- sharp, edgy and borderline shouty. Okay, the Blu Astraeus paint on our test car hides most of the lines and creases, but the Urus in Giallo Auge (yellow) is striking and honestly a sight to behold. 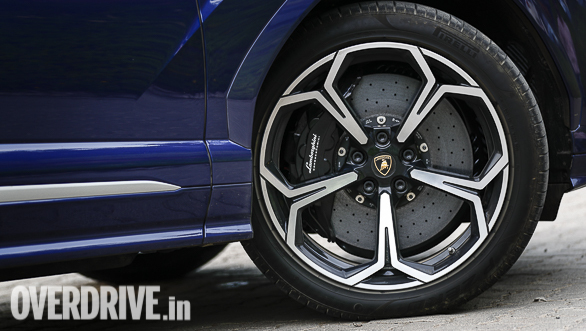 The shape of the bonnet as well as the sleek headlamps are reminiscent of the Aventador. The bumper, in effect is a massive airdam with hexagonal and Y-shaped elements forming the grille. It's a face that you'd instantly associate with a Lamborghini, sharp and with just the right amount of aggression. A characteristic design element of the Urus is the Y-shaped lines that are omnipresent, whether it's the exterior or the interior. 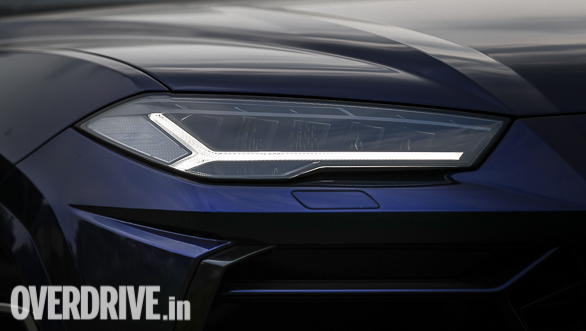 You'll notice the shape of LED DRLs and tail lamps as a Y and so are the lines on the front fenders. The side profile, to me, is one of the best angles to view the Urus. While wide haunches are textbook SUV, the squared wheel arches and sloping roofline add the requisite dose of sportiness to this performance SUV. The tail section is short and windshield is raked at a sharp angle. I particularly like the boot spoiler that seems to merge with the crease line running towards the rear fender. 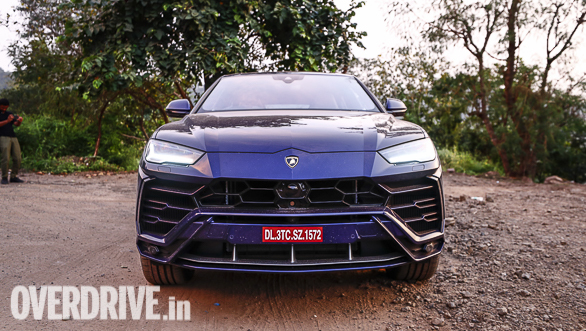 The Urus is an SUV but it looks as sharp and aggressive as any other Lamborghini, in keeping with the ethos of the brand. The design theme continues on the inside as well and I like how the cockpit wraps itself around the driver. The attention to detail that's been lavished across the cabin is frankly, astounding. 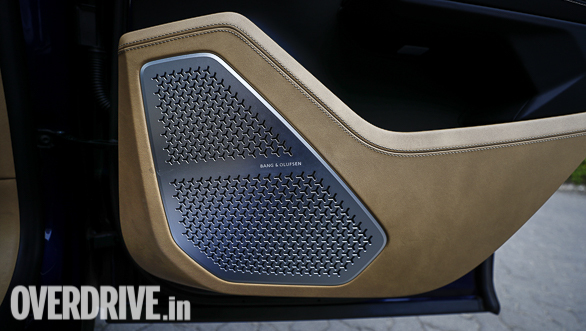 From the hexagonal a/c vents to the Y-shaped cut outs on the optional Bang & Olufsen speaker covers, it seems like the designers were on a mission to ensure there are no bland surfaces. Even the pedals have Y-shaped indents! The standard seats are heated and fully electric, 12-way adjustable with an option to fit an 18-way adjustable seat with ventilation and massage functions. 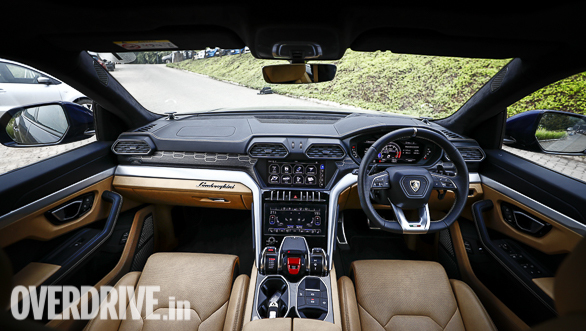 The Urus can be opted for in a four (includes fully electric rear seats) or five seat configuration. While the coupe like roofline and heavily raked windscreen may suggest poor headroom, there's surprisingly enough space for someone over 6ft tall. The TFT instrument console is crisp and offers a tonne of information, depending on the mode that's selected. 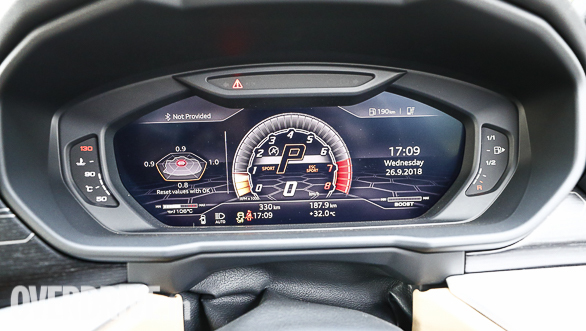 In Corsa (Track), for instance, the layout changes to a larger font (a la the Aventador SV) for the gear selected with a prominent rev bar above it. A graph to the left shows instant power and torque outputs while a large G-force meter shows the extent of fun you are having. But to me, the highlight of the cabin is the centre console. 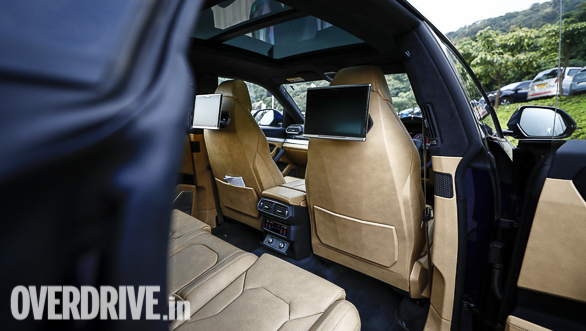 There are two TFT screens, the top for infotainment and the bottom for operating the HVAC and other functions. The screen also has haptic touch, which gives you decent feedback akin to pressing an actual button. In addition, the screen also doubles up as a virtual keyboard with hand-writing recognition. That said, operating the screen requires more than a gentle prod to select a function, which can get a bit annoying. 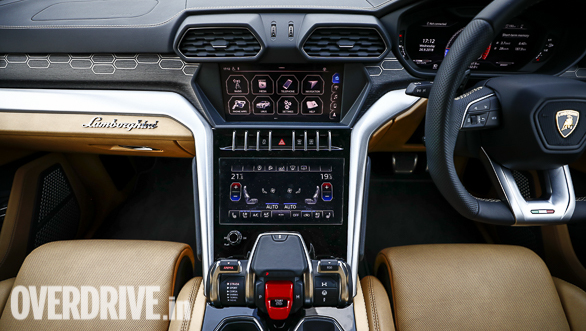 The infotainment system also displays the Urus from the outside in 3D. 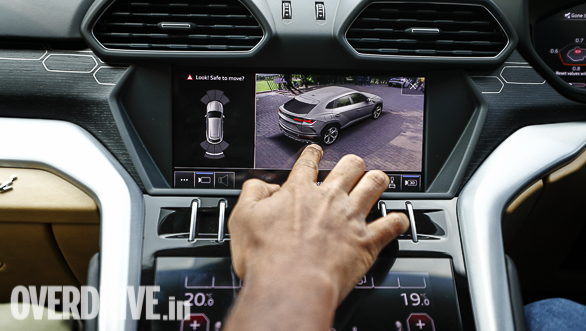 Step on the brakes, turn the indicators on and the virtual car on the screen does exactly the same. Talk about attention to detail! But the party piece in this cabin is the Tamburo (drum in Italian) that lets you choose between the six driving modes via the ANIMA lever. That said, it's slightly counterintuitive as you can scroll from one mode to another in one direction only. There's an Ego lever on the other side of the Tamburo (these Italians can make even something like a drum sound so cool!) that lets you set the engine, transmission and suspension to suit your style. Even the engine start/stop switch, that's placed behind an openable flap, elevates the experience. There's a sense of occasion that you feel behind the wheel and why not, when you are ready to pilot the fastest production SUV, currently on sale. And it sure does feel like an occasion when you fire up the 4-litre, twin-turbo V8 that's nestled under the bonnet. The motor barks to life and quickly settles into gruff idle. This is Lamborghini's first, turbo-petrol engine that develops 650PS@6,000rpm and a mind-boggling 850Nm between 2,250rpm and 4,000rpm. It may not have the spine-tingling shriek of Lamborghini V10 and V12, naturally aspirated engines, but instead has a distinct growl that intensifies as you toggle from Strada (street) to Sport and Corsa (track). 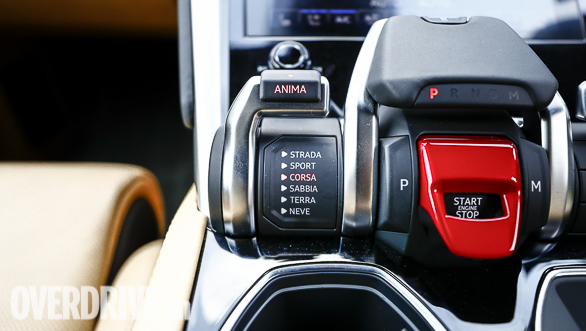 In addition to these modes, the Urus gets three, off-road specific modes-Sabbia (Sand), Terra (mud) and Neve (snow). 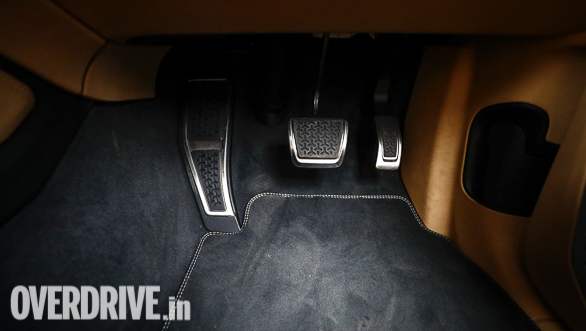 These modes alter the engine and transmission (8-speed ZF) settings as well as how the Urus rides and handles. The Urus gets adaptive air suspension that also alters the ground clearance between 158mm and 240mm. In Strada, the Urus feels like any other big SUV. The throttle response is gentle and there's hardly any sound filtering into the cabin. What's amazing though, is the ride quality in this mode. It is firm yet absorptive, despite our test car running on massive, 22-inch wheels (wheel size option ranges between 21-inch and 23-inch). 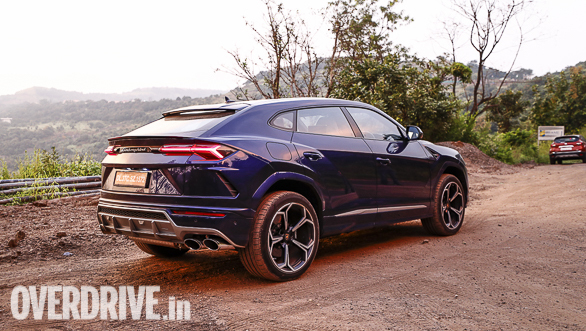 The Urus absorbed everything in its path, including a few potholes on the Pune highway. Sport turns everything up a notch and it feels like the right balance of sportiness and practicality. My favourite mode, however, is Corsa that turns everything up to eleven. The sound is louder, the steering heavier, gearbox response is sharper, the ride height is at its lowest and the throttle response primed for every twitch of the right foot. The way the Urus darts towards the horizon, in Corsa, is beyond words. Lamborghini claims a 0-100kmph time of 3.6s while the 200kmph mark will come up in little over 12s. That's proper supercar territory, by the way! And then there's the viciousness of every upshift that feels like a jolt to your back. Okay, you can't really do that all day long and yes I know I was not driving on a racetrack, but the sensations you feel are so strong, the drama so addictive, I couldn't help but keep the ANIMA in Corsa for most of the drive. The Ego mode, on the other hand, lets you customise the steering, suspension and chassis settings but I didn't really get the time to explore this feature. 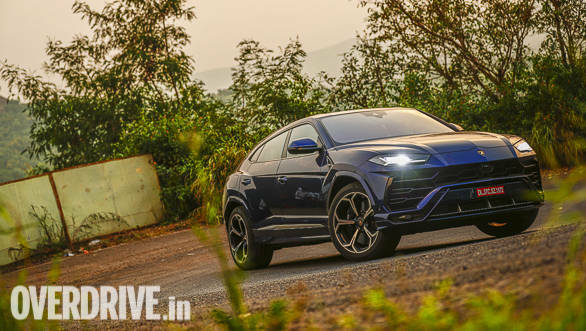 But all of what I've told you about the Urus' performance, so far, is while driving on the arrow straight sections of the Mumbai-Pune Expressway. 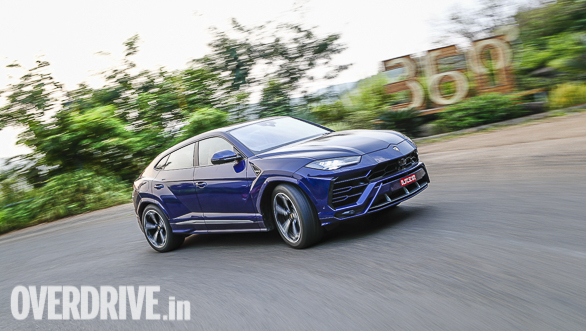 The real eye-opener about the Urus is the way it drives through a set of corners. I was left gobsmacked by the sheer speeds that the Urus manages and how flat it remains throughout. The electronic sorcery in the form of four-wheel steering, torque vectoring and active roll stability control is what lends the Urus with serious agility. Four-wheel steering, as the name suggests, turns the rear wheels +/- 3 degrees, depending on the vehicle speed and mode. At low speeds, the rear wheels turn opposite to that of the front wheels, effectively reducing the wheelbase upto 600mm. This is useful while maneuvering in tight parking spaces or around hairpins. At high speeds, the rear wheels turn in the same direction as the front wheels, resulting in rock-solid stability around fast corners. The active roll control firms up the outside suspension while attacking corners, ensuring the Urus stays flat with the horizon. Also, torque vectoring combo of a Torsen diff and an active rear differential is a gem. Mash the throttle pedal out of a corner and the way Urus squats and drives out is something that you just can't comprehend. All you're left wondering is if you are behind the wheel of a big, family SUV or a track machine. It really is that good! Of course credit is due to the bespoke Pirelli P Zero tyres that offer seemingly endless grip. The carbon ceramic brakes (massive 440mm discs at the font and the biggest so far on any Lamborghini) are another highlight, offering superb bite and feedback. Okay, I'm going to stop beating around the bush. 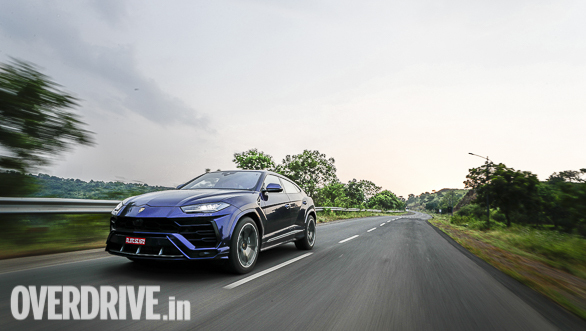 The Urus is the most practical Lamborghini you could buy in India. You don't have to really bother about where to drive it or quiver in fear of scraping the underbelly over a speed hump like you would in a Huracan or Aventador. The Urus is properly fast and fun to drive, throwing your beliefs about an SUV, out of the window. 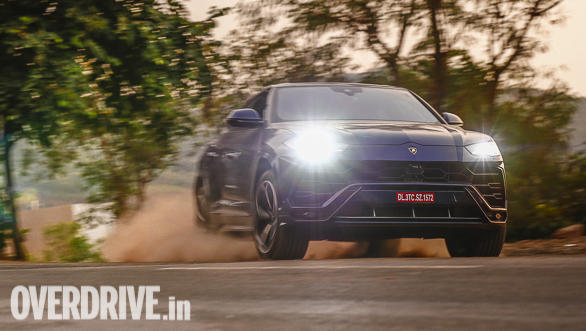 At a little over Rs 3 crore (ex-showroom), the Lamborghini Urus is probably as close as you can get to an everyday supercar, or super SUV, in this case. No wonder then that the first batch of Urus' that have been allocated for India are all sold out.